The meseta. Ah, the meseta. Can any good come from walking this long, unwavering line? 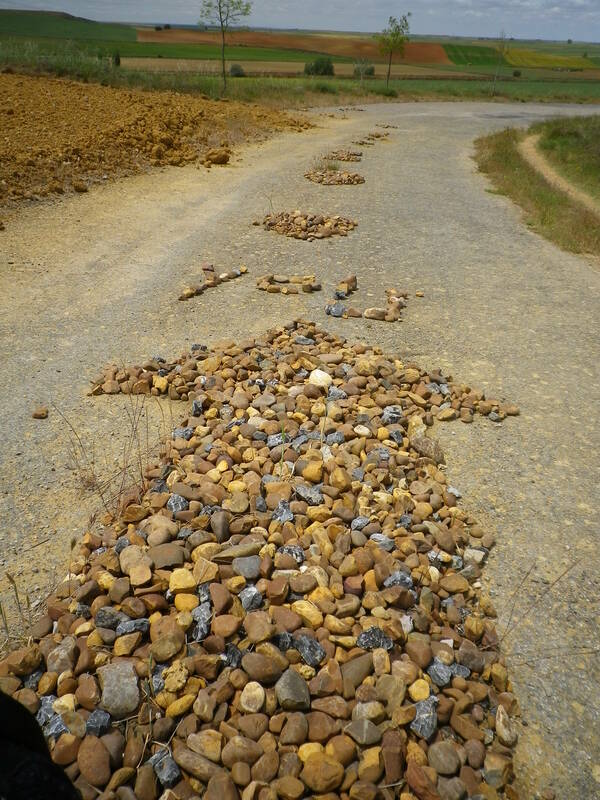 My friends, the Camino is full of surprises. Expect the unexpected and be open to unanticipated consequences. It took a good seven hours to get to the next town. It was sunny, hot and dry. Leave it to St. Philip, the “humorous” saint, to put me in a situation in which I WANTED a bit of water from the sky. Ha, ha, if you’ve been following my tale from the soggy beginning. I arrived at the albergue late in the day but was not happy to find that there was no more room in the bunk bed (cheap) side of the building. If I wanted to stay at this albergue, I would have to stay in the hotel side in either a double (I was solo) or in a single. As I dug through my meager assortment of euros, I sadly faced the fact that this night was going to blow my budget big time. I considered the idea of walking to the next albergue, although chances that there would be room were slipping away with every minute of hesitation. Plus, I would face at least three and a half more kilometers of walking in the heat. I must have looked pretty distressed because the hospitalero decided to give me a break on the price of the single and I decided to take it. I had my own bathroom and took a leisurely shower. I dried myself with their towels! Yay for me!! I hand washed my clothes in the horse-trough looking tub they had out back and hung them up – they would be dry within an hour. My sleeping bag would stay in my pack tonight – I was going to sleep on clean, white sheets tonight, baby!! I ambled over to the dining room/bar in the front of the albergue, bought a glass of cold white wine, sat at a table on the grass, and took off my sandals. I could begin to write in my journal. The sun would set in a few hours and I officially considered this day over. My friends, Carlos and Andres, came up the Camino hoping for a room. I told them I thought the albergue was full but told them to give it a try. Sadly, they had to move on to the next town before they would be able to stop for the night. Sipping, writing, I met a New York Puerto Rican, Damian. A fellow pilgrim, we instantly became friends. I’m Puerto Rican. Rather, New Yor-Rican. Second generation, my Spanish language skills were basically non-existent at the start of my trip but my Spanish cultural skills are pretty good. And, although I’ve lived in many, many countries, I think New York City is the Capital of the World (sorry, rest of the world). I hope you can see why Damian and I would get along. Damian and I sat outside in the sun and talked. He translated when a fellow pilgrim had a really nasty blister crisis and needed to get to a hospital. We talked about why we were each on the Camino. We had another wine, then went inside and had a forgettable Pilgrim menu dinner. Ah, Camino, you work in mysterious ways. Damian had done a good thing. He had shown up at the albergue shortly after me. Remember that there was only a single and a double available when I arrived? I took the single. He could take the double or keep on walking. He had taken the double. Along came a pilgrim, looking for a bed. Sadly, the albergue was full. But Damian did what any pilgrim would have done. He offered the pilgrim, whose name was “C,” the other bed in his double, if she wouldn’t mind sharing a room with a stranger and splitting the cost. Sharing a room with a stranger is not as unusual as you may think, dear reader. 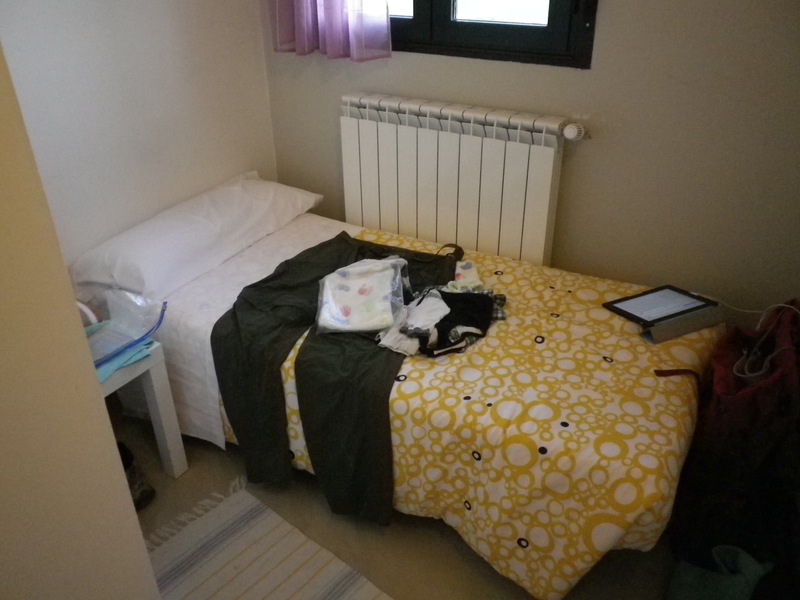 Every night on the Camino has been spent sharing a room with strangers, men and women, young and old, snoring, scratching, farting, laughing, coughing, packing, in various stages of dress and undress. Nothing means anything anymore. It’s all about helping each other, being considerate of each other, and getting a good night’s sleep. So Damian and C shared a room that night. The room next door to mine, in fact. And those walls were gossamer thin. They talked well into the night. About what, you are indelicately wondering? Strangers, brought together by the Camino? A charming, good-looking, single man from New York and an exhilarating, likeable, single woman from Germany? Both having been through the good and bad of life and now walking the Camino looking for . . . what? What could they talk about until falling asleep? Who has how many where. What caused them. What remedies they’ve heard of. What worked. What didn’t. What they might try. What they hadn’t tried yet. Socks. How many layers of socks. Shoes. Boots. Sandals. Powders. Creams. Wraps. I fell asleep to the sound of them discussing their blisters. They left early the next morning. Although I never saw either of them again, I have it on very good authority that they walked the rest of the Camino together. 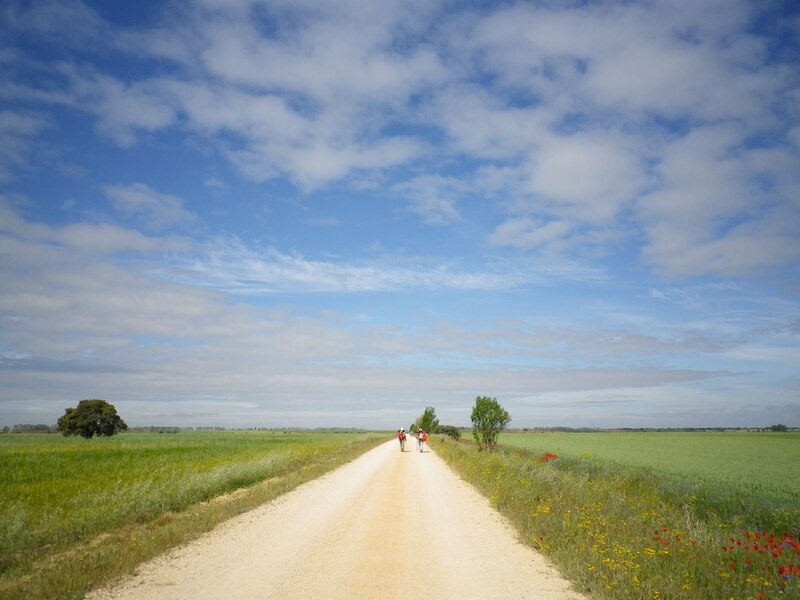 And that, my dear reader, is the endearingly sweet and mysterious way in which the Camino occasionally brings people together and brings them what they didn’t know they were looking for. 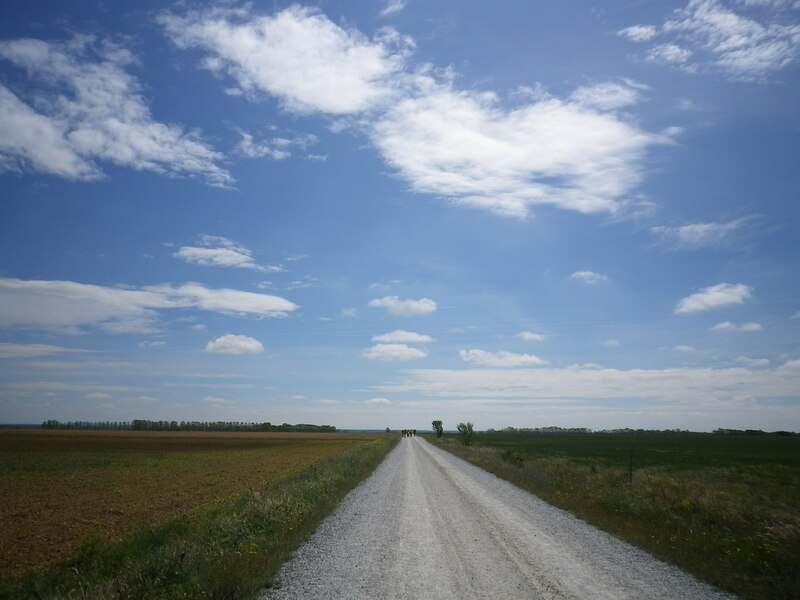 This entry was posted in camino de santiago de campostella, Religion, Saints, Spain, Travel and tagged Camino de Santiago de Campostella, love, Saints, Spain, Travel, women hiking solo. Bookmark the permalink. But what else did you hear??? Haha – it was a great story Kathy!